My deer and elk hunting are over for the year, but we are already planning next year’s hunt. We hunt–for the past 25 years–in GMU 346 Little Naches in Eastern Washington on the foothills of the Cascade Mountain Range. This is all public hunting land comprised of private timberland and public forest. Home for our camp for usually five weeks of the year, we set up the weekend or two before deer and take it down the last day of elk season. The first two weekends are the set up, where we gather firewood to last the whole season. We normally get about six large pickup loads, which will last us throughout both deer and elk. Our season, for modern rifle is nine days for deer, a week off and then nine days for elk. Pack it in? Pack it out! My son Bryan and my friend Jerry are my hunting partners. We usually have other friends stop by and/or help us with the logging chores. I am a hiker, whereas Bryan and Jerry are much more patient and usually sit in blinds not moving much from their favorite honey hole. I get impatient when I sit and don’t see anything, so I hike to a new area. Some of you probably are the same way. There must be something better over that next ridge or down a certain trail. I therefore get to see much more of the land, than the other two, but of course I pay for it with sore legs the next day. My pet peeve is it seems everywhere I hike I find trash, litter, etc. It seems like I hike where ‘no man has been’ only to find a soda can, juice can, beer can, snack wrapper, or, this year, many Mylar balloons. I understand when things blow out of the back of your truck–on the side of the road and you don’t realize it–but come on, way up the side of the mountain there are cans! Who packs these cans? I have a Crooked Horn backpack and it has two large bottles for water. These are what I use for hydration. Why would I want to carry a soda or juice can with me, let alone a beer can? We pack sandwiches in plastic bags, which are easily placed back in your pocket to dispose of at camp. The area we hunt has a lot of recreational activities year ’round. From old logging roads to jeep trails, motorcycle and horse trails to snowmobiling and general hiking trails. But I believe where I hike for hunting, hunters must be throwing the stuff all around as there are usually no roads near by. Like I said, I hike were it seems no man has gone or should go but yet here there is litter everywhere. If you pack it in, you should be able to pack it back out! Come on hunters, let’s all do our part and pack it back out or make sure you pick up what others have left. One day this year coming back to camp I even rode on the running board of the 4 x 4 so I could see and then pick up trash along the road. It made me feel good to pick up this unsightly stuff and dispose of it. We made a game out of it and got rid of a lot of trash along the way. While I’m at it, let’s talk about the plastic ribbons hunters use to mark their trail back to a kill sight. 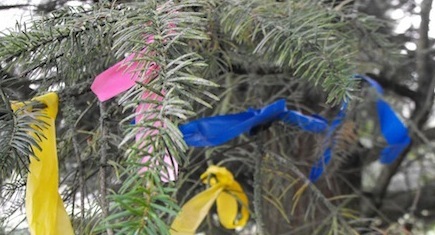 When you get all your ribbons up, so your buddies can come help you, that’s great, but on the way out make sure you take the ribbon markers off the tree limbs. I saw one marked trail this year I swear they were every two feet. Come on guys, you can follow a trail better than that! If you are unsure, take a compass reading or mark your waypoint with your GPS. We can all do a better job cleaning up after ourselves and helping others do the same. 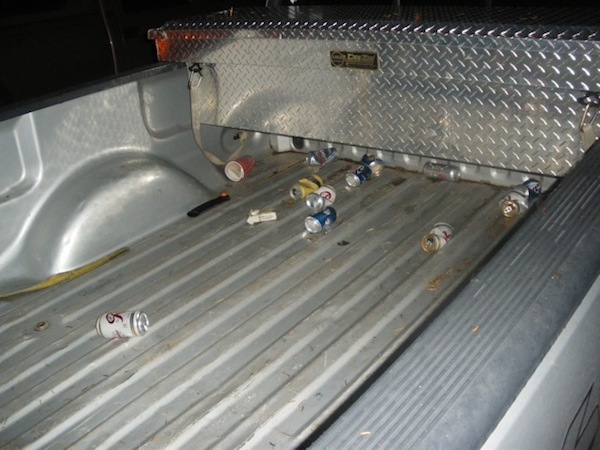 I don’t want the John Q Public to think all the trash belongs to us hunters, but they are more than likely to think that way if we don’t do a better job picking up the litter and trash. So when you are out elk hunting, deer hunting, upland bird, turkey or waterfowl hunting, let’s do our part to make the areas we hunt a better place to be. Ryan, yes that would be fine.